Dr. T. Ramon Stuart is Provost and Vice President of Academic Affairs at Fort Valley State University. The veteran higher education administrator provides direction for the Office of Academic Affairs, the hub of curricular and co-curricular student programming at the university. The Academic Affairs division encompasses the Colleges of Arts and Sciences, the College of Education and the College of Agriculture, Family Sciences and Technology. The division also houses Financial Aid, Student Success & Enrollment Management, Retention Services, the Hunt Memorial Library, Office of Institutional Research, Planning and Effectiveness (OIRPE), Quality Enhancement Plan, Upward Bound, TRIO Educational Talent Search, Title III and Sponsored Programs, among other departments. Prior to joining FVSU, Stuart was a key leader at West Virginia State University (WVSU). His accomplishments at WVSU include; developing an engineering 2+2 degree program, aiding in increasing retention by almost 10 percent in three academic years, serving on the self-study reaffirmation steering committee responsible for achieving a 10-year reaccreditation and helping to increase overall enrollment by expanding international recruitment. He also assisted in increasing the number of students earning dual credit while in high school and expanding college access for TRIO participants. During his career, Stuart managed an institutional budget that exceeded $12 million; while, he led various university administrative areas, including Academic Educational Outreach, the Center for Online Learning, Cultural Activities, Graduate Education, the Honors Program, International Student Services, Registration and Records and TRIO (i.e., Upward Bound, Upward Bound Math-Science and Student Support Services). Stuart is known for his commitment to student success in the classroom and beyond. The administrator previously taught students at K-12, associate, baccalaureate and graduate levels. His successes in the classroom led his peers at West Virginia State Community and Technical College to select him as faculty member of the year before electing him to serve two consecutive terms as the institution’s faculty senate president. 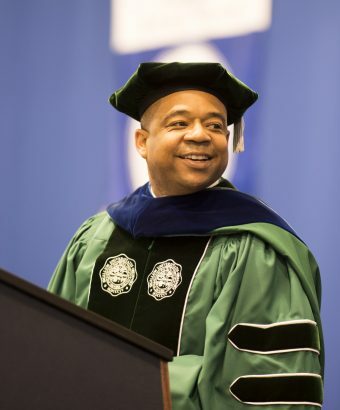 Stuart earned his doctorate in higher education administration from the Gladys W. and David H. Patton College of Education at Ohio University. He earned both undergraduate and graduate degrees from the Benjamin M. Statler College of Engineering and Mineral Resources at West Virginia University. Stuart is the recipient of numerous awards from various civic, fraternal and professional organizations, but the recognition that he cherishes most is when he helps students start and finish college.